It’s undoubtedly been a good year for stocks, with the S&P 500 up almost 15% year-to-date. But, it’s been an even better year for the oft-embattled tech giant, Facebook (FB). Shares in the omnipresent social media company are up 33% so far this year. FB has taken quite a beating over the last year on user privacy concerns and other regulatory issues. The company has dealt with issues ranging from not doing enough to curb election interference to promoting hate speech to selling user data to dubious third-party vendors. Moreover, there are growing calls by government officials to break up FB and its alleged monopoly power in the social media space. Cleary, there has been plenty of bad news in recent months. As such, investors have to be pleased with the year-to-date results of FB stock taking everything into consideration. But, can the current bullish trend continue? And what about all the concerns from the previous year? First off, I don’t think FB is in any real danger of getting broken up. I believe it would be very difficult to prove monopoly power for a company like Facebook, which technically has plenty of substitutes and competition out there. On the other hand, other regulatory and privacy concerns are still an issue. FB is attempting to get in front of these issues (after months of criticism). However, the company still has a lot of work to do to improve the massive hit to its reputation. Nevertheless, FB still has plenty of growth potential. That’s mostly because Instragram is still extremely popular, along with WhatsApp. Both platforms were acquired by Facebook and have continued to thrive and grow. In fact, an analyst thinks Instragram’s new e-commerce service could produce $10 billion in revenues by 2021. That’s obviously music to the ears of current investors, who saw the shares gain over 3% when the analyst comment hit the wire. Options action on FB has been plenty bullish as well. The last week of options activity has been roughly 70% bullish. Earnings are due during the first week of May, but many of the large trades I’ve seen expire in April. So, it wouldn’t be a shock to see the share price climb into next month’s earnings. One trade in particular was about as bullish of a trade as is possible with options. This trade, called a risk reversal, has the strategist selling puts to finance a call purchase. Downside risk is precarious below the short put strike, but upside gain potential is enormous. 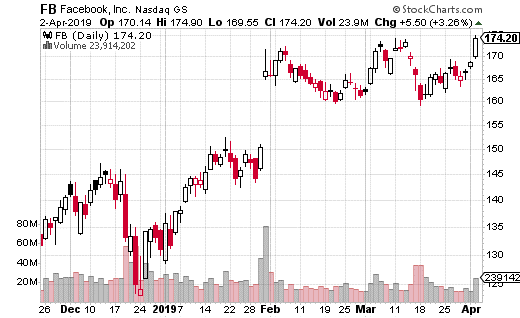 This particular trade expires April 18th and involved selling the 162.5 put and buying the 177.5 calls with the stock at about $174. The trade cost $1.42 and was executed about 1,000 times (for a total cost of about $150,000). That makes the breakeven point just below $179. The 162.5 put was sold as a way to lower the price of the call, which would have cost nearly $2.00 without the proceeds from the short put. However, in return, the trader could lose $100,000 per $1 move below the put strike plus the premium cost of the trade. Conversely, the trade generates $100,000 per $1 move above the breakeven point. By the way, that breakeven point of $179 is much closer to the price (about $174) than the short put strike. If FB closes in between the strikes at April expiration, the trade only loses the premium paid. Still, this is clearly a very bullish trade over the next two weeks. There is quite a bit at stake using a risk reversal, so the trader clearly has a strong opinion on FB’s upside potential. Now, most people shouldn’t mess with risk reversals, which are mostly used by professional traders. Instead, you can make a bullish trade on FB with limited risk over the same period by using a vertical call spread. For instance a similar bullish trade for April 18th would be buying the 177.5 strike call and selling the 182.50 strike call. The trade only costs $1.25 and that’s all you are risking. The gains are capped at $3.75, which is still 300% return potential. That’s not bad for a trade with clearly defined and limited risk.